The murder of Mohammed Abu Khdeir has unleashed intense fighting between Israel and Hamas around the Gaza Strip which has been going on for a week. The Israeli court refused to give the names of the suspects, who have not been formally charged, however it did state that two of them were minors. The Jerusalem Post revealed that the main suspect in the investigation, a 30-year-old man, attempted to kill his own daughter weeks before the homicide. It is believed he may cite previous mental health problems in mitigation. "I expect soon to get the investigative material, in which I will look for support for the assessment there is a complex problem in the matter of my client's criminal culpability," an attorney for the organization, Honenu, said. It was also claimed by Israeli media reports that the other two teenage suspects will likely claim “temporary insanity” in the grisly murder of the 16-year-old. Petah Tikva Magistrate’s Court also confirmed that three of the suspects involved in the kidnapping, torture and murder of Abu Khdeir had unsuccessfully tried to abduct a different victim in the same area the night before. According to Israel's Shin Bet security agency, in the early hours of July 2, as Muslims marked the end of the daylight Ramadan fast, the three suspects "patrolled Arab neighborhoods of Jerusalem for a number of hours, in an attempt to find a victim to abduct, until they spotted Mohammed Abu Khdeir." Further revelations stated that only three of the six suspects were directly involved in the abduction and murder. The court has maintained a gagging order concerning the three minors, as well as certain details about the three adults who have been charged. Abu Khdeir’s badly burned remains were found at 5.20 am on July 2 in woodland in East Jerusalem. An autopsy report later showed that the 16-year-old had been alive when his attackers set him alight, after soot was found in his lungs. The subsequent investigation included comprehensive reviews of public and private security cameras, forensic testing and the escape route taken by the suspects, the court said. While a private camera captured the image of two of the suspects before forcing Abu Khdeir into their car, the vehicle itself was not captured on film, the investigation’s report said. The investigative unit was able to track the car used in the abduction to the Adam settlement in the West Bank, at which time the arrests were initially made of the three adults and three minors involved. 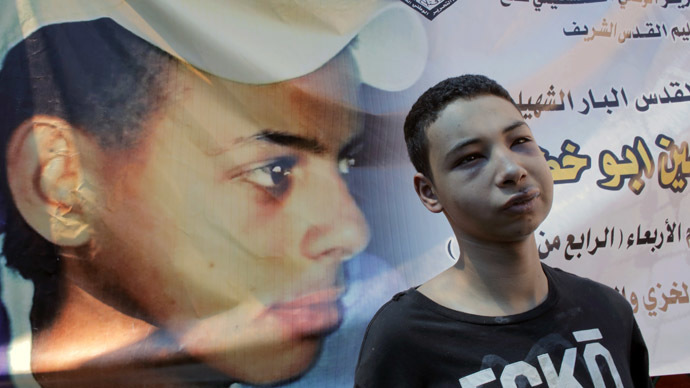 Israeli Prime Minister Benjamin Netanyahu deplored Abu Khdeir's murder as "loathsome." He ordered police to find the culprits swiftly and pledged to see them prosecuted to the full extent of the law. To make matters worse for the Abu Khdeir family, Mohammed’s cousin Tariq, who was visiting relatives while on vacation from the USA was brutally beaten by police just days later. 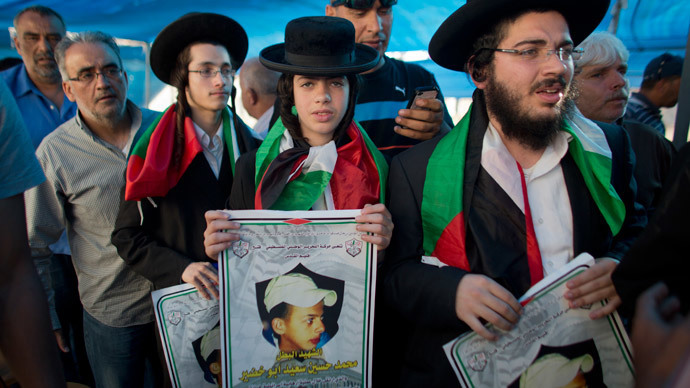 The murder of Abu Khdeir was seen as a revenge attack for the killing of three Israeli Jewish teenagers last month. Their bodies were found on the 18th day of the search in a field northwest of Hebron on June 30. 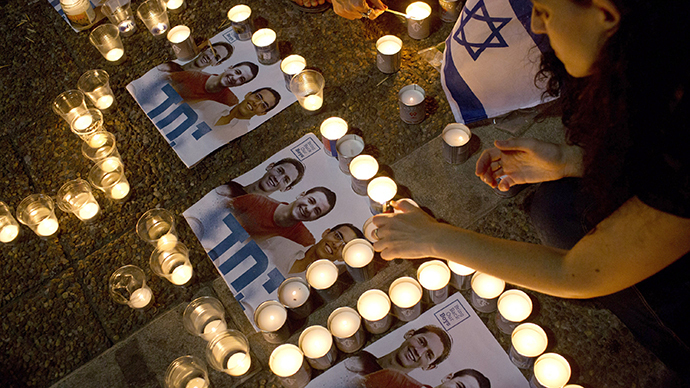 Israeli Prime Minister Benjamin Netanyahu Netanyahu vowed to bring the perpetrators to justice. 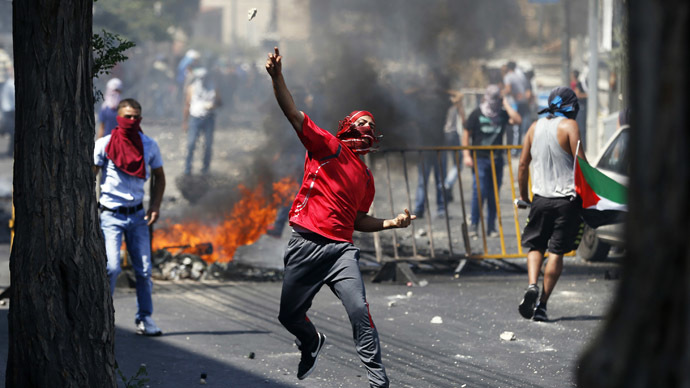 The fallout from the murder of both the Palestinian and Israeli teens has led to renewed tensions between Israel and Palestine. Hamas militants resumed rocket attacks on Tel Aviv on Monday after a 24-hour lull in strikes on the Israeli commercial capital, and Israel has kept up its air and naval bombardments of the Gaza Strip despite growing pressure for a ceasefire. Around a half-dozen Israelis have been wounded since the start of the week-old offensive, which Gaza health officials say has killed 169 Palestinians, most of them civilians.